Former chess champion Garry Kasparov has failed to take the game's top job from a multi-millionaire who says he was once abducted by aliens. Mr Kasparov saw fellow Russian Kirsan Ilyumzhinov retain his position as head of the World Chess Federation at a vote in the Norwegian Arctic city of Tromso. Mr Ilyumzhinov has run the federation for 19 years. However, his critics accuse him of being a Kremlin puppet with ties to brutal dictators. Mr Ilyumzhinov won the election on Monday with 110 to 61 votes, on the sidelines of the Chess Olympiad in Tromso. Mr Kasparov - a regular critic of Russia's elite - said the procedure was rigged. "This has been an unfair fight from the very start," Mr Kasparov said before the vote. 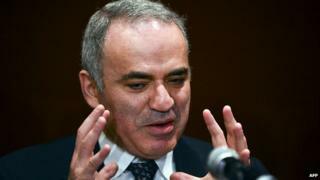 Mr Kasparov, 51, is a noted human rights campaigner and an opponent of Russia's President Vladimir Putin. He accuses Mr Ilyumzhinov of being too close to Russian President Vladimir Putin and says his presidency of the World Chess Federation has been marked by "abuse and favouritism". "Every Russian embassy in the world has been mobilised to support Mr Ilyumzhinov and to keep him in office," Mr Kasparov told Norwegian newspaper Dagbladet. "It's not about chess. This is a pure political fight." Mr Ilyumzhinov, 52, claims he was once abducted by aliens who communicated telepathically and took him to another planet in a giant spaceship. His critics say such claims have driven sponsors away from the game. He has also been accused of damaging the reputation of the chess federation by cultivating close ties to dictators including Saddam Hussein and Muammar Gaddafi. In a recent interview with the New York Times, he said: "Chess is beyond politics. [That] is why Kasparov is so dangerous. This is why it's necessary to fight him. This is what the chess world was afraid of: Kasparov started mixing chess with politics."